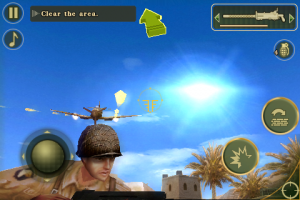 As we reported late last month, Touch Arcade had the opportunity to visit Gameloft’s Manhattan offices and spend a bit of hands-on time with their upcoming WWII-based first person shooter, Brother in Arms 2: Global Front. Tonight the game landed in the App Store and, after spending a few days with this final build, we have some thoughts to share on Gameloft’s latest. 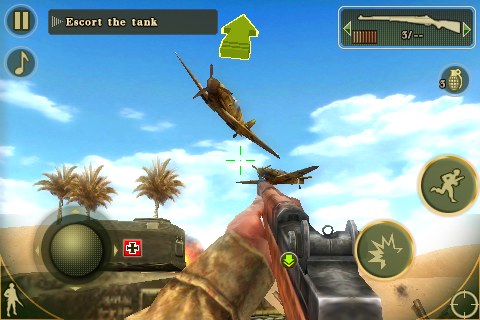 When the first Brothers in Arms title for the iPhone landed in the App Store back in November 2008, it was a highly notable release and almost certainly the most complex 3D game to be released for the platform at the time. It was (and is) a well executed iPhone take on an extremely popular console / PC franchise, wowing most but drawing criticism for a “difficult" control system. Brothers in Arms 2: Global Front, designed from the ground up specifically for the iPhone, comes to us over a year later. So what has a year brought us in the sequel to such a bold initial platform release? Quite a bit, it turns out. Brothers in Arms 2, weighing in at over three times the filesize of its predecessor, brings to the iPhone a much larger game experience. This time around it’s a first person affair, as opposed to the third-person, over-the-shoulder experience that is the first title. 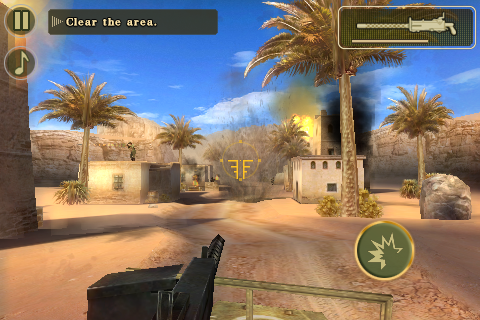 Actually, when in duck-and-cover mode, BIA2 does jump out to third person — and that’s something you’ll see often, as using crates, walls, and tanks for cover is pretty much par for the course in this title. That is, when you’re not sprinting across the battlefield, manning the turret in a jeep or tank, or piloting a “glider" through heavy flack. Yea, it’s pretty intense. BIA2 drops you neatly into WWII as the young American soldier David Wilson on a mission to push back the Germans and Japanese and get the backs of his brothers in arms in the thick of battle. But, before long, an ominous bit of correspondence reveals that his actual brother, Eric, has been killed and was given the medal of honor — but that medal was revoked due to uncertain circumstances. It’s Wilson’s additional mission to get to the bottom of the mystery and clear his brother’s good name. Pretty heavy stuff, really. The tools of the trade are many. 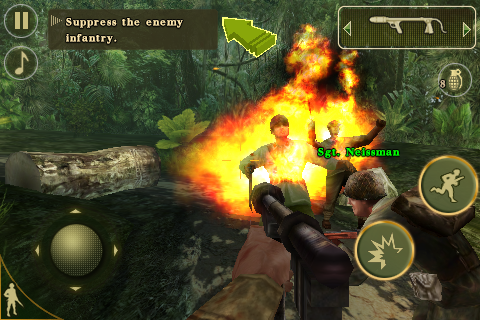 Available weapons include bazookas, fixed machine guns, flame throwers, Thompson submachine guns, and grenades. (The default play mode offers targeting assistance, which I find helpful, but it can be disabled.) There are three different modes of play, in all, to choose from. The default is a mission to mission progression through 13 levels across five different locales: Pacific, Sicily, Normandy, Germany, and North Africa. Any unlocked locale can also be chosen for quick play in Campaign mode. And, finally, local network play is possible by way of either WiFi or Bluetooth connectivity. The game’s control system feels a bit more workable than that of the original iPhone release. This is due, in part, to the various refined methods of multitouch, onscreen controls offered, but also to the fact that, during the year that’s gone by since the originals release, we’ve come to know a great many 3D shooters utilizing dual-stick (and the like) controls. We’re just far more used to this iPhone control mechanic than we were back in November 2008. Whatever the precise combination of reasons, you’re going to find BIA2 to feel more comfortable than did the original release. While BIA brought impressive visuals when it made its debut, so too does BIA2, and that’s said taking into account the significant raising of the bar that’s taken place over the past year. The environment models have indeed grown in complexity, but more impressive are the subtle visual touches that BIA2 brings. Shafts of light through the trees, HDR blooms (there’s an options toggle there) — it all comes together to make for a pretty amazing looking game, very “modern console"-like (on my 3GS). 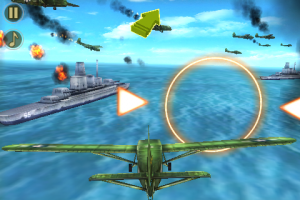 The game features various trophies that are granted based upon particularly savvy battlefield performance, as well as for finding as many “Kilroy was here" tags as possible. Performance is tracked by way of the integrated Gameloft LIVE network. And, while the game offers excellent action, often at a frantic pace, it does have a few shortcomings. Framerate is generally quite high on the iPhone 3GS, but occasional (loading?) lags do occur, causing brief pauses in the action and studders to the audio at times. As well, in an apparent glitch where I went off the expected story line, I entered a room and wiped out everything alive, exited the room, only to find it once again full of enemies upon revisiting said room — though this was an isolated occurrence. And, about that room full of soldiers, or soldiers anywhere in the game, really — the enemy AI that commands them is quite basic. If you’re re-playing a scenario after having died, the enemy does the exact same thing the second time around, making it quite easy to wipe out the lot. A little more complex / varied AI would certainly add depth to the battle experience. See Gameloft’s recent trailer video for a look at a variety of in-game scenarios. 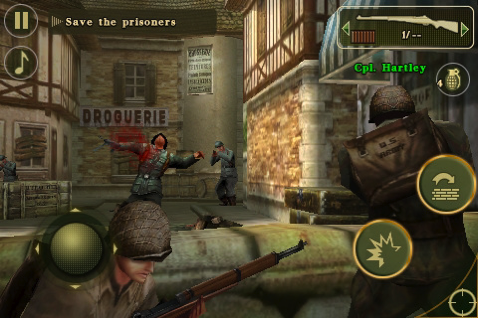 That I can pick a few nits in the title does not mark Brothers in Arms 2 a game to avoid. On the contrary, it is a highly enjoyable, action-packed shooter that offers some of the most intense battle sequences you’ll find on the iPhone, making this latest from Gameloft a gaming experience that’s rather hard to pass up.